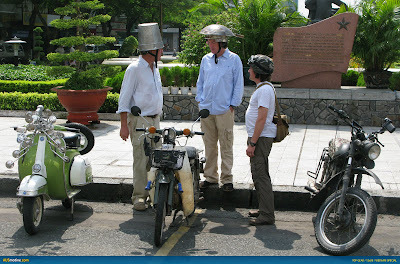 On December 28, 2008 BBC 2 broadcast a special edition of the award winning show Top Gear in which the hosts were challenged to travel approximately 800 miles from Saigon to Halong Bay in the span of 8 days. Traditionally the hosts equip themselves with cars using money supplied by the program, but this time they did not have enough money for 4 wheels and, reluctantly for Jeremy, the resigned themselves to buying a bit more economical. 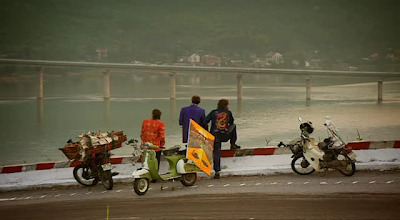 Jeremy ended up with a peach of a Vespa, James bought a Honda Cub and Richard snagged a small displacement Soviet motorcycle. Their journey produces comical lows and breath-taking highs as the trio treks across city and country in pursuit of victory. Even when you don’t consider the scooter aspect, the program is hugely entertaining and educational. You really owe it to yourself to check it out. Here's our post on this episode, which shows Clarkson's crash. Plus links to the entire episode. Thanks for posting this! I have been to Hanoi twice and am sure this BBC special is going to be awesome! 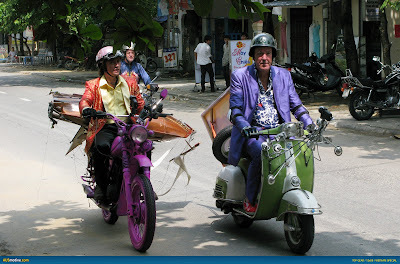 Does anyone know what Vespa model/year Jeremy Clarkson is riding?